This is the second piece in my Gesture series, a series of works that use imagery of my own hands. I start with a basic concept, one that by definition is concise and easily understood. However, these concepts often are viewed differently by each of us, as our experiences and point of view greatly affect our interpretation and personal meaning of these ideas. From this simple concept, I use the images of hands to build upon the idea and make it my own. Life symbolizes the idea that it is our relationships with others that form the basis and meaning of our lives. The two hands represent different people. The hands interact and intertwine, just as we have friendships, relationships, and bonds with others. 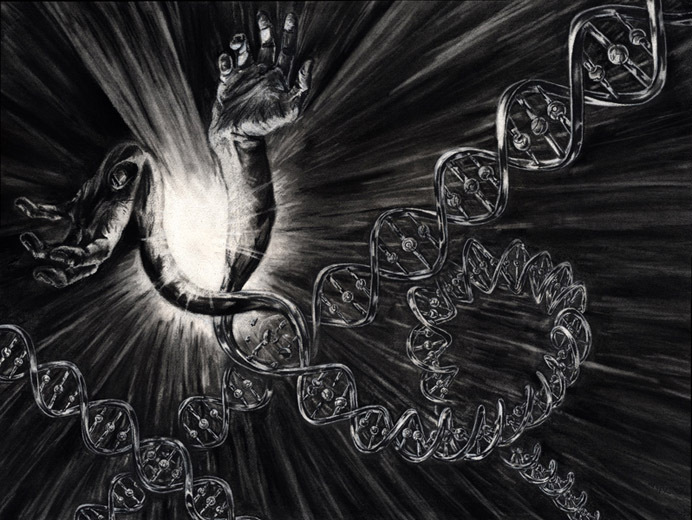 The basis of life, represented by DNA, stems from the relationship of the two hands. The original sold at the Fall 2005 show of Nashville group, Untitled.